Bangalore India - crab masala and rice, originally uploaded by shashiBellamkonda. The cuisine is southern Konkani, so the food is related to the Mangalorean restaurants I posted about in Mumbai. 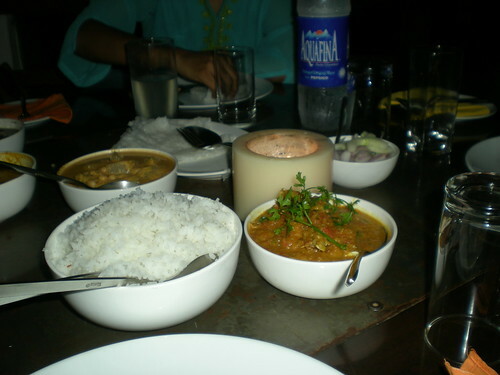 (Though the restaurant does include at least one northern Konkani dish.) I found it to be remarkably different than those places, though, with a brightness, simplicity and elegance that the coastal joints lacked. Food is cooked in earthenware pots. Rice and vegetables are grown specifically for Kanua, and they only use produce which is natural to the region. I don’t know how much of this is BS, but the food is exquisite. The flavors include coconut, jaggery, tamarind and chilli. It’s sweet and hot. Or rich and sour. Or both, but lush. The real estate is one sector that features as one of the most badly hit sectors following the global economic meltdown. Especially in developing countries like India, where real estate was going great guns, so to say, faced a steep downfall following the recession and inflation. Especially in the metros and the developing cities like Bangalore, real estate suffered dearly as the demand for the residential units, though increasing became a pent up demand. The badly hit economy particularly the IT sector that has a strong foothold in Bangalore, and the high rates of interest in home loans made the demand for residential units go down or at best become a pent up demand. It is believed that once the situation stabilizes the demands would start surfacing. Another very problematic issue that the real estate dealers are facing is that patrons of the currently booked flats are not willing to pay the original price that they had agreed on but the current price that is less than the original amount owing to the current economic condition. Not only the residential units but the commercial properties like the hotels in Bangalore have also naturally seen a drop in their occupancy. The ITC hotels in Bangalore that registered the highest occupancy, as high as 83%, have been forced to cut down on their tariffs by almost 20% as the occupancy has also gone down by 20%. On the contrary, the business hotels in Bangalore are surviving the tough times as the number of business travelers has not been affected as hard as the umber of leisure hotels. The budget hotels in Bangalore have seen a hike owing to the obvious reasons.